For a limited time only, ‘Philips ZOOM’ cosmetic in clinic laser whitening is reduced from £495 to £295. Your smile is an important asset, as it has an immediate effect on others. The reaction that we have to a beautiful smile is completely subconscious, and has been well-documented. A dazzling white smile naturally draws the human eye. A bright smile gives the perception of success, health, a friendly nature, trustworthiness, and more. Research demonstrates that we feel happier when we smile more. This is because the act of smiling releases “feel good hormones” such as serotonin in the brain. Baby teeth tend to be a brighter shade of white than adult teeth. Though genetics will determine the brightness of enamel, the most common factors in teeth becoming dull and discoloured are food and beverages. What you eat and drink on a daily basis, from fruits to juice to coffee or wine, will deposit tiny particles of colour onto teeth. If you do not rinse or brush your teeth after each meal, snack, and drink, these deposits will show over time in the form of dullness or yellowing. In addition to food, tobacco will cause teeth to change colour over time. Discolouration is a common problem that stands in the way of social interaction and self-confidence. Whatever the reason for the change in your smile, a solution exists. With tooth whitening treatment performed by the qualified doctors of Notting Hill Dental Clinic, you can transform your smile to your liking. There are many ways to eliminate stains on teeth as there are factors that cause them. Many people seek a convenient solution for discolouration by purchasing an off-the-shelf home-whitening kit. Other methods of stain removal may be found online, but they risk tooth enamel wearing away. The safest and most effective teeth whitening method is that which has been prescribed by a qualified dentist, as they have assessed your oral health. At Notting Hill Dental Clinic, we use a clinically proven system that is safe for adults of all ages. Professional care takes into consideration your overall state of oral health. It considers restorations (which will not get whiter) or gum disease. By consulting with your dentist for teeth whitening, you can feel confident that you will get the outcome you want without causing damage to your teeth or gums. We don’t leave your smile to chance. You shouldn’t either. Cosmetic stain removal using Airflow polishing is more advanced than a simple scale and polish; it leaves patients with same-day cleaner, brighter teeth. It can remove staining from red wine, smoking, coffee, or tea. It involves using a mixture of jet water, air and sodium bicarbonate to clean teeth, and is usually done by the Hygienist. It is a safe procedure as no chemicals are used, therefore no risk to any irritation. In-office laser teeth whitening is ideal for many of our patients. The expedited process lets you achieve the results you want in one day rather than a few weeks. The in-office whitening procedure is ideal for individuals with busy schedules that would inhibit the daily application of whitening gel, as well as for those who have an important event coming up. Even if your reason for wanting in-office whitening is simply that you don’t want to wait to see your brightest smile, we are happy to accommodate you! It is important to note that in-office whitening may not be the best solution for the patient with sensitive teeth. In consultation, your dentist will discuss methods for reducing sensitivity while enabling you to enjoy your most attractive, most confident smile. Whitening your teeth at home, you can achieve the same dramatic results that are possible with in-office teeth whitening. The process simply takes a little longer. 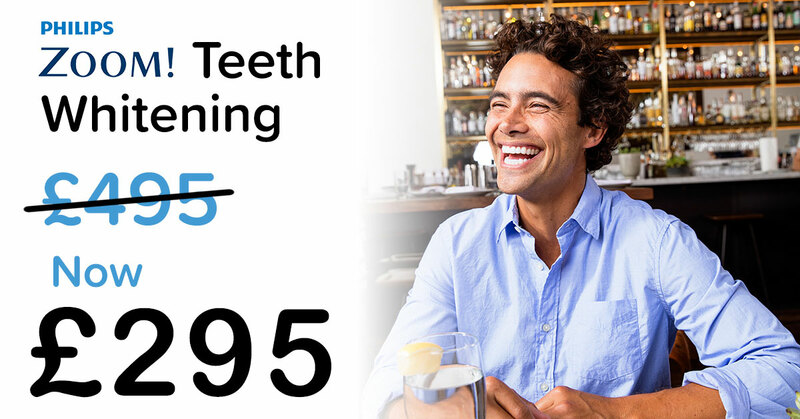 This treatment, the original method of removing stains from enamel, involves the daily application of a powerful whitening agent via custom fit trays. These trays are an important part of optimal results because they keep the whitening gel against enamel. The other key to results is the concentration of peroxide found in professional grade whitening gel. After a week to two weeks of daily use, your smile can be transformed. In cases of severe discolouration, we may suggest a fast start with in-office whitening treatment followed up by a course of home whitening to reach deep-set stains. Feel great about your smile! Contact Notting Hill Dental Clinic to discuss teeth whitening treatment. Professional-grade bleach is more concentrated and more powerful than commercial products. The reason your dentist can carry highly concentrated solutions is because a thorough examination of teeth and gums is performed before the treatment. Commercial products must be safe for everyone. As a result, they are largely ineffective for most people. Risks are minimized when teeth whitening is overseen by your dentist. This is true with both in-office and home whitening. By using one-size-fits-all strips or trays, there is a good chance that whitening gel will move onto the gums and cheeks, where it can cause irritation. Our home whitening trays are made to fit comfortably around your teeth. In-office treatment removes stains within an hour. Just one visit to get the smile of your dreams. When you choose this option, we do all the work for you, ensuring your comfort and desired result. Professional teeth whitening treatment achieves dramatic results in a shorter period of time than commercial whiteners. In-office treatment is nearly immediate, while home whitening gives you dramatic results over the course of a week or two. Satisfactory results in teeth whitening come from personal attention given to your smile. Before the whitening procedure, we may recommend a professional cleaning. This removes plaque, allowing maximum absorption of bleach. For friendly service, and for safe teeth whitening that works, contact Notting Hill Dental Clinic on 0207 229 8300 today.